Thank you. You should be receiving a reset link at the email address you provided shortly. Thank you for your interest in this program. We should be contacting you shortly. A CompTIA™ Network+ Certification is a widely recognized and respected credential within the Information Technology industry. With this certification, you can demonstrate that you have the knowledge and skillset to take on a critical role in data networking. If you're relatively new to IT and/or networking, CompTIA™ Network+ is an industry recommended certification as a first step in professional-level networking. Upon completion of the program, you will be given a voucher to take the CompTIA™ Network+ certifying exam. Throughout this program you'll build upon your existing IT knowledge by exploring computer networking concepts, including layers of the OSI model and the TCP/IP model. To gain further understanding, you will be able to practice the concepts being taught, using interactive virtual software. This program will fully prepare you to take the CompTIA™ Network+ Certification exam, thoroughly covering each of the exam objectives as outlined by CompTIA™. This program will prepare you for a career as a network technician and qualify you to take the CompTIA™ Network+ certification exam (N10-007). CompTIA's Network+ certification is vendor-neutral and will give you the skills you need to manage, maintain, troubleshoot, install, and configure basic network infrastructure. You'll master basic networking concepts and gain a fundamental knowledge of network design, security, cloud computing, forensics, advanced IP addressing concepts, and routing and switching. Upon successful completion of this program, you will receive an exam voucher for N10-007 at no additional cost. Upon registering, you're given six (6) months to complete this program. This program is compatible with the Windows 7 and later operating systems and all current Internet browsers. This program can be taken on either a PC or Mac device. Mac users are encouraged to have access to a Windows environment on their device. You'll need to have email capabilities. Adobe Flash Player and Adobe Acrobat Reader are required for this course. Click here to download the Acrobat Reader. Click here to download the Flash Player. Although it's not a prerequisite, it's helpful if you have at least nine months of experience in network support or administration or academic training, along with a CompTIA™ A+ certification. This program will prepare you to obtain a CompTIA Network+ Certification designation. After completing the program, you're encouraged to set up your own exam dates and times at a testing center close to you. 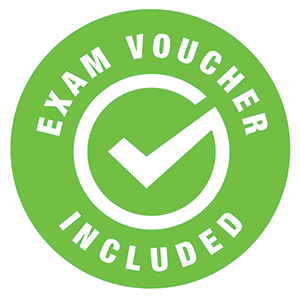 An exam voucher is included in the cost of tuition. This program is supported by a team of highly experienced industry professionals and educators. This team is ready to answer questions, to provide insight and guidance, and to help ensure all students have a successful and engaging learning experience. David Grimes. David brings over 10 years experience in IT, education, instruction, curriculum design, combined with extensive management and leadership experience in the private and non-profit sectors. His passion for technology and education has led David to work as an academic dean, student services director, technology coordinator, teacher, consultant, and technology columnist and blogger. David holds a Master of Education and a Bachelor of Science, both in Technology Education, from Ohio State University in Columbus, Ohio. In addition, he has earned IT industry certifications and has been published in a book on gamification in the classroom. 1. Can I register for programs if I am an international student? Yes, because ed2go programs are online you never have to actually travel to the school. Most schools offer telephone or online registration. 2. How long does it take to complete a program? All of our programs are self-paced and open enrollment, so you can start them when you want and finish them at your own pace. You'll have six months to complete this program. 3. Do I have to buy additional materials? All the materials you'll need are included, and their cost will be covered by your tuition. ed2go will ship all materials ground service upon enrollment. 4. Can I get financial assistance? ed2go courses are non-credit courses, so they do not qualify for federal aid. In some states, vocational rehab or workforce development boards will pay for qualified students to take our courses. 5. What happens when I complete the program? Upon successful completion of the program, you will be awarded a certificate of completion. You will also receive a voucher for the CompTIA Network+ N10-006 certification exam. 6. Am I guaranteed a job? ed2go programs will provide you with the skills you need to obtain an entry-level position in most cases. We don't provide direct job placement services, but our facilitators and career counselors will help you build your resume and are available to give advice on finding your first job. Facilitators will also be available to use as a professional reference upon completion of the program. Potential students should always do research on the job market in their area before registering. 7. Who will be my instructor? Each student is paired up with a facilitator for one-on-one interaction. The facilitator will be available (via e-mail) to answer any questions you may have and to provide feedback on your performance. All of our facilitators are successful working professionals in the fields in which they teach. 8. What software or hardware do I need in order to take online programs and what are the system requirements? In order to take our online programs, you must have access to a computer and the Internet. You can access the program contents from any Web-enabled computer. You don't have to use the same computer to log-in to the program every time. We recommend that you have a word-processing program (Microsoft Word is best) and the latest version of Internet Explorer. 9. How do I do the applied labs if I don't have equipment? The majority of labs can be done using the online lab system. A lab scheduling link is included. 10. Can I use a Mac? 11. How can I get more information about the program? If you have questions that are not answered on our website, please feel free to contact us via LIVE chat (click the button toward the top of the page). If you are visiting us during non-business hours, please feel free to send us a question using the "Contact Us" form to the right. You may also call us at 1-855-520-6806 1-855-520-6806 FREE. We will answer your questions promptly. 12. When can I start the program? Our programs are all open enrollment. You can register and start the program as soon as you are ready. Please note: Once the program curriculum is accessed online or through submission of a material shipment confirmation, refunds cannot be issued. 13. Do the CompTIA programs get me prepared for actual certification? The ed2go CompTIA Online Training Programs give you the training for the exam. Once you complete your online program work, you can move forward to take the certification exam. CompTIA certification testing is administered by third-party vendors such as Prometric and Virtual University Enterprises (VUE), two leading providers of technology-based testing. Both offer a network of computer-based testing centers with thousands of locations worldwide. An exam voucher is included in the cost of tuition. 14. What if I don't have enough time to complete my program within the time frame provided? The time allotted to complete your program has been calculated based on the number of hours for each program, so don't worry too much about not completing in time. If, after a concerted effort, you are still unable to complete, your Student Advisor will help you work out a suitable completion date. Please note that a fee will be charged for an extension. Copyright © Education To Go. All rights reserved. The material on this site cannot be reproduced or redistributed unless you have obtained prior written permission from Education To Go. Education To Go and ed2go are registered trademarks of Education To Go, a part of Cengage Learning. A password reset link has been sent to the email address you provided.